All digital art begins from a single building block—a pixel. And if the Internet has taught us anything about art, especially our favourite friend Paint, it is that you can make art from just a handful of pixels. But imagine bringing that potential in art creation to real life. Enter Pixors, a company dedicated to bringing pixel art to real life whether it’s on your car windows, paper, or walls. With little colourful squares, you can use Pixors to create any piece of art you want, much like you would use legos to build a castle. Founded by James Wee, a mechanical engineer based in Penang, Pixors launched a Indiegogo campaign to raise USD$5,500, which met its goal in just 29 days. Pixors was Wee’s brainchild, and was inspired by many events in his life. As a child, he said that the wall was his “largest workspace”, to the frustrations of his parents. As an avid gamer, he was also inspired by games from the 90s like Metal Slug, Megaman, Super Mario, and Pacman, which were all extremely pixelated. But with game graphic quality becoming better and better, pixelated games are more about art and nostalgia than they are about necessity. 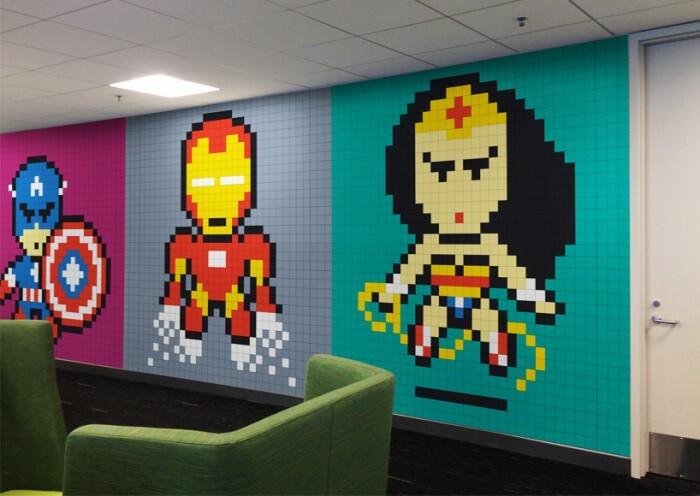 Their brand of pixel art may be more familiar to most as post-it art, where people paste the popular 3M sticky notes onto walls to create pixel-like murals on the wall. But Pixor’s pixels are much more durable; made from special PVC film, the pixels have lifespans of up to 3-5 years when applied outdoor, but last much longer when applied indoors. The unique adhesive technology used in Pixors also sticks to most smooth surfaces, which means that glass, metal, wood, or cement are all fair game. It was only in January of this year that James decided to quit his job of two years in manufacturing to pursue his dream of starting his own business. He hit the ground running, spending the first few months understanding every aspect of the business, from sourcing to manufacturing. But while Pixors was originally created for adults, James noticed a possible benefit for children. Eunice Guok, a school teacher, was brought on board to help develop Pixors for children. 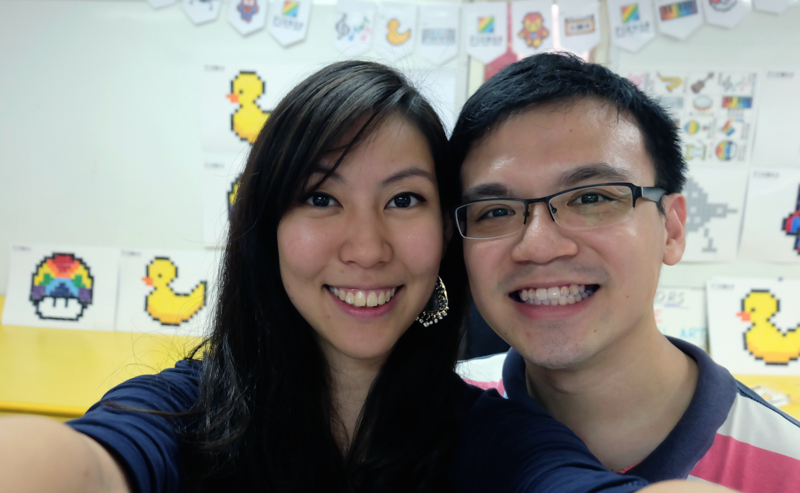 They tested their product with a kindergarten in Penang called TopKids with children from ages 4-7, and organised workshops to get children involved in making their own pixel art. 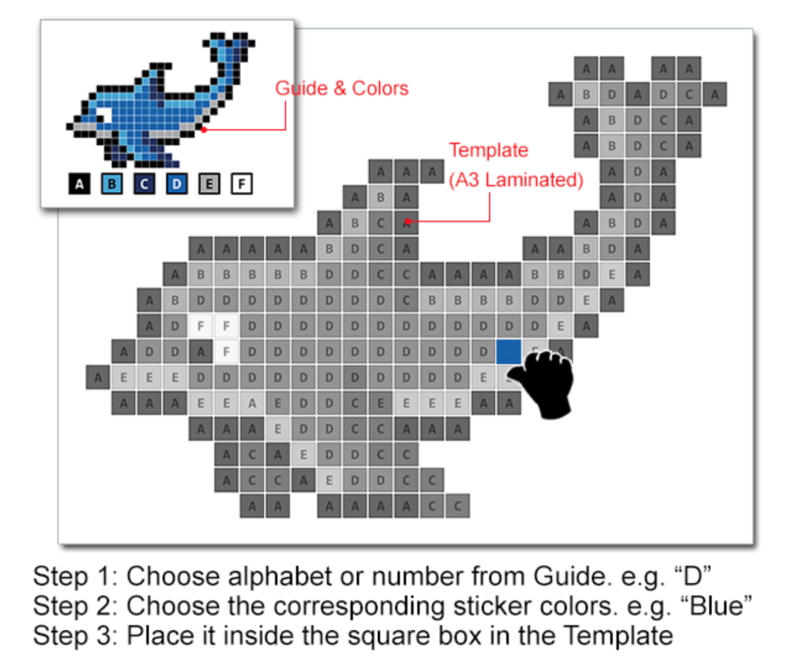 It was then that Pixors Children’s Pack was introduced, which consists of a specially laminated A3 template, a guide card marked with numbers and letters, and Pixors stickers. Pixel art, it seems, have great benefits for children, like teaching them to improve fine motor skills and stimulate creativity. The templates that were given to each child to refer to also helped them become more familiar with alphabets, numbers, and colours. Pixors seems like they’re on the right track to begin their startup journey. They’ve participated in the Singapore Maker Faire, where they received a “Maker of Merit” award, and were also shortlisted to participate in the MyMaker section in KL Converge 2015, and had great reception from the crowd, especially the children. And now that their goals are met, they pledged to conduct one free children’s workshop for every extra $100 raised. So if you’re looking for some new quirky art to put on your wall that expresses that insane love of the digital world within you, put the post-it pads down and settle for something much better.